Under the Presidency of Pauliina Haijanen (FIN/EPP), the “Baltic Sea” Interregional Group in the Committee of the Regions met on 1 December 2017 to discuss the Baltic 2030 Action Plan. 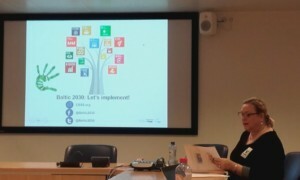 Krista Kampus, Head of the Baltic 2030 Unit at the Council of the Baltic Sea States (CBSS) Secretariat, presented the Baltic 2030 Action Plan and its role in translating the Sustainable Development Goals (SDGs) into the Baltic Sea Region context. The Action Plan was endorsed by the CBSS Foreign Ministers in June 2017 and provides a common vision for sustainable development in the Baltic Sea Region. The Action Plan encompasses six focus areas, including climate change. Krista provided the group with an update on the work of the CBSS Expert Group on Sustainable Development, in which the CPMR’s Baltic Sea Commission is involved. The Baltic Sea Commission has identified the “role of Regions in implementing the SDGs” as one of its priority areas for 2017-2019. Regarding the implementation of the SDGs, Krista said that countries in the Baltic Sea Region are performing well. The Baltic Sea Region has been a frontrunner in supporting the implementation of the SDGs since their launch in January 2016. She emphasised the key role of Regional Authorities in the implementation of the SDGs. She also said that the EU Strategy for the Baltic Sea Region (EUSBSR) provides an important framework to support the implementation of the SDGs in the Baltic Sea Region. Krista also informed participants about the Baltic Leadership Programme (BLP) on the 2030 Agenda which aims to increase the capacity of stakeholders in the Baltic Sea Region to implement the SDGs. The Baltic Sea Commission attended the first BLP modules, which took place on 12 October 2017. More information can be found here. The CPMR Baltic Sea Commission is hosting the Secretariat of the Interregional Group “Baltic Sea”. The next meeting will take place in early February. More information to follow.